WHIMZEES provided Sugar a variety of WHIMZEES dental chews. Golden Woofs only shares information we feel is relevant to our readers. If you are struggling with brushing your dog’s teeth, dental chews can be a cost-effective way to help keep your dog’s teeth clean and healthy. WHIMZEES’s vegetable-based texture helps remove plaque and tartar. The GROOVES from the chews help hard to reach spaces between your dog’s teeth. The HOLLOW WHIMZEES shapes and spaces make it easier for your dog to grip and chew. The unique KNOBBY shapes help scrapes away plaque and tartar build-up. 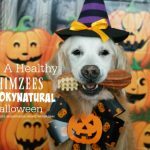 WHIMZEES dental chews are gluten free and 100% vegetarian. It is made in Holland with natural ingredients such as Potato Starch, Glycerin, Powdered Cellulose, Lecithin, Malt Extract, and Yeast. Also, WHIMZEES uses natural colors such as Alfalfa Extract, Annatto Extract, Malt Extract, and Calcium Carbonate. SUGAR loves WHIMZEES dental chews and has greatly helped with her aging teeth. 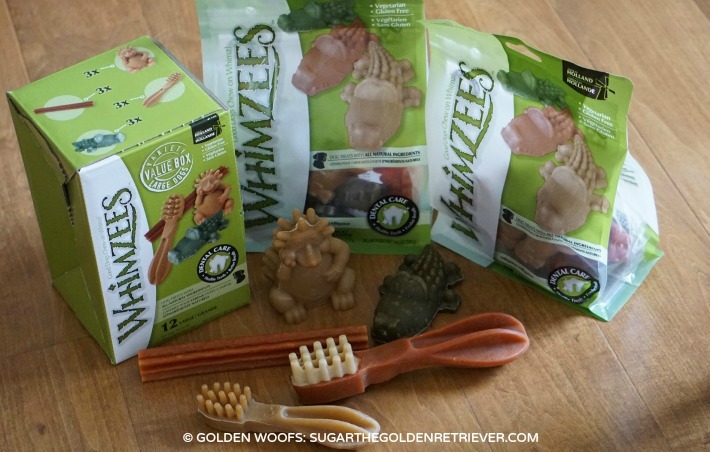 Visit whimzees.com for more information about their dental chews. Stay informed about the latest WHIMZEES news on their Twitter, Facebook, Instagram, and Pinterest. Make sure to join #WHIMZEESWednesday and #FanFriday! 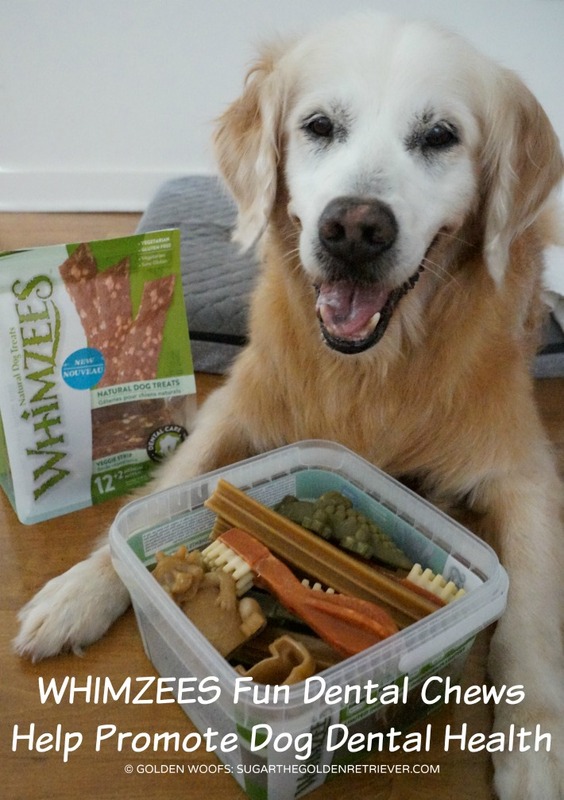 To celebrate Pet Dental Month, WHIMZEES is providing two of our readers a box of WHIMZEES. To join, follow the giveaway tool. 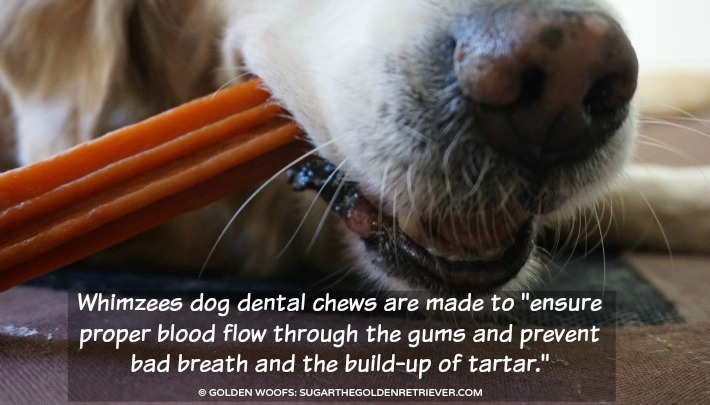 Do you give your dog dental chews? Very important we brush at night before bed, always a struggle!Lol! I have to use my finger- these would be great! we loveeee whimzees and greenies! we usually buy Greenies, but we may just have to try these. you look adorable, Sugar! Now we know how you keep your pearly whites so white!! They get a dental chew as a nice treat after they get their teeth brushed. I do give the dogs dental chews. They are both rescues and one is a 15 year-old senior who had never had dental care in his life. So, the chews, some stuff that treats the water and a small fortune in vet bills is how we take care of their teeth. Kenji loves Greenies and Whimzees. He has also tried the Costco version of Greenies and likes those too. i do sometimes, but my dental vet does not like the hard ones. so if we won these i would donate them to Safe Haven Cat shelter for the pet food bank which is for both dogs and cats. or i might use it for their upcoming auction to raise money for their rescue. 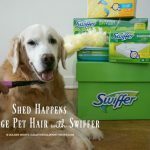 i am currently donating about 300 or more of dog products and some cat products. this is their big auction of the year. but getting back to your question, i do use some of the softer dental treats for my girls. i have little girls so their teeth cant take the hard treats and they are not timid chewers either so that makes it even worse. already spent thousands on gum graphs, root planing, crowns, fillings, etc. Special toothbrush for my dogs. We’ve tried dental chews a few times. Would be interested in trying this is their adorable as well as good for them. my dog loves his dental chews! My dogs get all kinds of chews. The best so far are real cow bones – the femur or the tibia. We get them from the butcher shop. The Vet says the senior dogs have the best teeth he’s ever seen. My 5 fur babies get dental chews. I have been reading about the benefits of having my dog teeth clean. I’ve been thinking about having my vet clean my babies teeth. I have three rescued Treeing Walker Coonhounds who all hate having their teeth brushed. I try to get them to eat dental treats, including chews, when I can. I have a couple of different dental sprays (which I can use on two, but my Seiji really doesn’t like them and I don’t want to get bit). 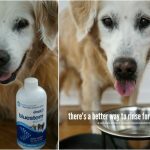 I will give Seiji and Kyoko the occasional rawhide – while I know they aren’t the best things for dogs, they clean their teeth better than anything else I’ve tried. I’ve bought a number of different brands of dental chews, including Whimzees. My Suki, who I lost last year in April (she was 15) loved the Whimzees and when she was so old, they were one of the only dental treats she showed any interest in. I’m actually planning on getting my three all dentals at the vet soon, but will need something to KEEP their teeth clean after the vet cleans them. My Shih Tzu loves Whimzees!! They sell them individually at our local ranch store so we thought we’d give them a try. He also likes the toothbrush shaped ones. We brush our dog’s teeth and we give him dental treats. He loves Whimzees and the only time he gets them is after his teeth are brushed. Yes, we use dental chews to help with their teeth. I also get yearly cleanings done on them. Yes, I give them dental chews, but probably not as often as I should. We only give our girls dental treats once or twice a month. They have digestive issues and we haven’t found any that don’t make them ill. I hope these will work and anxious to give them a try. Oh our dogs love the dental chews and I love how good they are for their teeth. We have never tried these Whimzees…look really good and healthy for them! Yes, we give our dogs dental chews and they also get their teeth cleaned at the Vet’s office yearly. Yeah we do even she definitely needs them sometimes. We give our dog dental chews all the time! He loves them! We have never heard of this brand but would be very interested in trying! I give my dog a dental chew everyday! !